The Buro Storm is an excellent seating choice when price and comfort are both important. 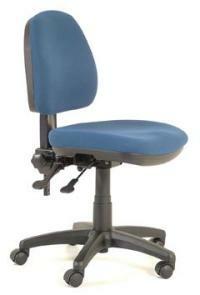 The design provides excellent lumbar support while still looking stylish and professional. Indicative maximum user weight 130kg. Full 10 year guarantee (excluding upholstery). Gas lift height adjustment: Intermediate 200mm, Architectural 270mm. Height and angle adjustable back. High density polyurethane moulded foam. Medium back with generous lumbar support.